This probably outs me as a morbid weirdo, but I think about being nuked each and every day. I gobble up books, TV and films about the subject: Command and Control (about the many screwups that almost led to Armageddon); Neville Shute's On The Beach; the terrifyingly mundane Threads; and many movies like When The Wind Blows, the nuclear explosion scene in Terminator 2: Judgment Day and, of course, Dr Strangelove: Or How I Learned To Stop Worrying And Love The Bomb. 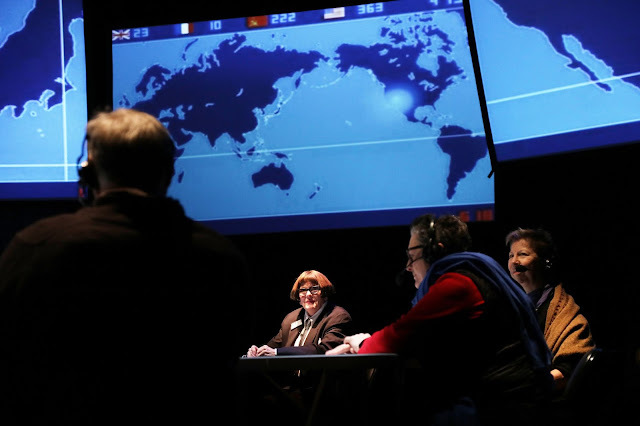 I haven't learned to stop worrying yet, and from the looks of things neither have queer comedy duo Split Britches (Peggy Shaw and Lois Weaver), whose Unexploded Ordnances (UXO) recreates the war room set from Kubrick's film and informs us that we have an hour until the bombs drop. With Shaw playing the US President and Weaver as a Jack D. Ripper-ish general, the apocalyptic deadline gives us time to ponder some important things about life, the universe and, y'know, everything. The vehicle for said pondering is a 'Council of Elders' composed of the oldest members of the audience. After ascertaining who they are by asking people to raise their hands if they were alive during World War II, the Korean War or the Vietnam War, they're asked to sit around a circular war table. As the nuclear countdown ticks down they're quizzed about their fears, ambitions and thoughts on the state of the world. Responses were somewhat depressing. The 'younger' old people all seemed terrified at the prospect of further aging, describing their fears of incontinence, their bodies continuing to fall apart and the sudden proximity of the Grim Reaper. On top of this, there was an unsettling pessimism of the state of the world in general, touching upon the Israeli slaughter of Palestinian civilians, plastic choking up the world's oceans, global warming and the incompetence and ineptitude in global political leadership. It's a bit worrying to hear people's misgivings at how they expect the world to be in 50 years, and how they will be unable to protect their children and grandchildren from whatever happens. The one ray of light comes with the oldest member of the council, 82-year old Margaret. She seems to have pragmatically accepted ageing and declares herself to be a born optimist, explaining that she's sure things will work themselves out somehow. It's a pretty vague platitude, but hey, I'll take it. The backdrop to this discussion is infographics showing every nuclear explosion from 1945-1998, with tallies by country in the top corner, B-52 bombers lazily trailing their way across the stage and 1950s stock footage of children practising 'Duck and Cover' (advice that is not as ridiculous as it might first appear). This stage dressing (together with reminders from Weaver's General that we're working to a deadline) help keep both the Council of Elders focused and ensure that things keep moving. But it's in sustaining momentum that Unexploded Ordnances (UXO) often comes a bit unstuck. By design the show meanders between subjects according to the whims of its participants, and I suspect it lives and dies by who ends up on stage. Even though I suspect we got a pretty interesting batch, there were moments throughout the show where things got exasperatingly aimless - more than once I wondered what the point of this all was. 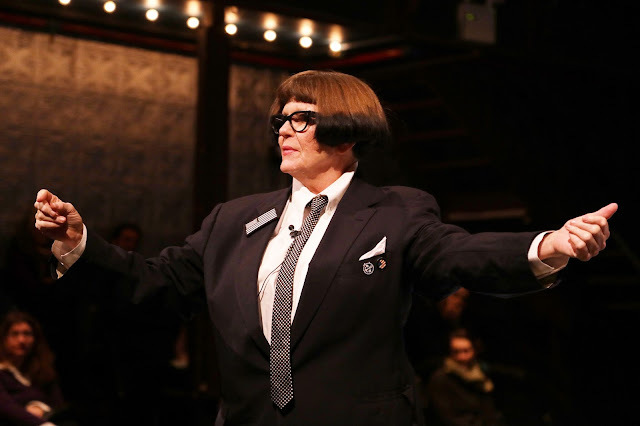 Fortunately, Split Britches isn't trying to be particularly enigmatic. The show's title refers to potentially lethal bombs (grenades, mines, shells etc) that remained buried long after the war they were used in was over. This explained as a metaphor for the unexploded ordnance within us - the fears we keep bottled up and the ambitions and desires we have not or cannot realise. Perhaps a tiny bit presumptuously the show posits itself as therapeutic for its participants, but they looked like they were engaged so hell, maybe it was. It made me reconsider my preoccupation with being incinerated in a nuclear holocaust: is it a practical fear or just an irreligious way of thinking about my own death? Visualising buildings torn apart in a hail of shattering glass, combined with a raging wall of fire moving at the speed of sound is a bit Roland Emmerich especially when, statistically speaking at least, I'm more likely to pop it slipping in the shower. Then again these bombs really do exist, they really are aimed at London and the people currently in charge of them don't inspire much confidence. It's an unsettling train of thought, and the mundane fears and desires we see here reminded me of Stalin's famous quote that one death is a tragedy and a million is just a statistic. Unexploded Ordnances (UXO) ends up as a tricky one to grade. The show often engages in self-critique, particularly when Weaver and Shaw explain that they never know how to end a show properly, after which they do indeed unceremoniously anticlimax themselves off-stage. Understanding and explaining your flaws doesn't excuse them, but it at least shows an honesty that few other shows have. But though this is a fuzzy and loose-limbed bit of theatre it's also a consistently thought-provoking one. And as always that goes a long way. Unexploded Ordnances (UXO) is at the Barbican Arts Centre until 19 May. More info here.